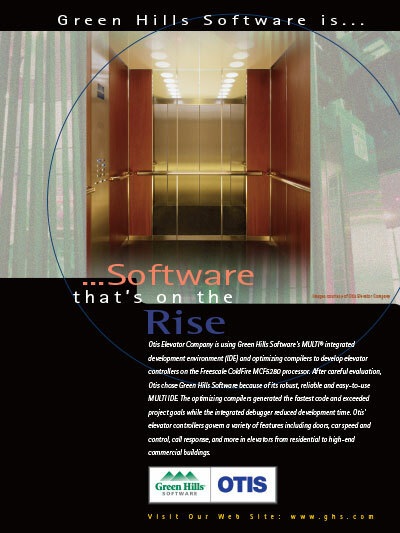 Otis Elevator Company is using Green Hills Software's MULTI integrated development environment (IDE) and optimizing compilers to develop elevator controllers on the Freescale ColdFire MCF5280 processor. After careful evaluation, Otis chose Green Hills Software because of its robust, reliable and easy-to-use MULTI IDE. The optimizing compilers generated the fastest code and exceeded project goals while the integrated debugger reduced development time. Otis' elevator controllers govern a variety of features including doors, car speed and control, call response, and more in elevators from residential to high-end commercial buildings.